For the past 27 years the annual Corobrik Architectural Student of the Year Awards have been the country’s premier event to highlight the creative and technical talent of the cream of South Africa’s architectural students and to drive the advancement of design excellence nationally. As climate change looms larger on the world stage, the environment and sustainability have become a key part of the equation. Add to the mix the diverse composition and aspirations of the rainbow nation and it is clear that the challenges facing the country’s architects of the future are becoming increasingly complex. He was presenting prizes to architectural students from the University of the Free State region on 1 November 2013. First prize of R8000 was awarded to Wynand Viljoen, second prize of R6000 went to Theo Gutter and the third prize of R4000 was won by Handre de la Rey. There was an additional prize of R4000 prize for the best use of clay masonry presented to Aleksander Troskolanski. This thesis aims to reunite the evacuees with their town through the only way possible, namely in death. The essence of the building is to decay, like radioactivity, over a period of 800 years. Through this decay, and the careful use of materials, the building will open towards the same winds that spread the radioactivity over the landscape, only now, after 800 years; the ashes of the people will be spread over a clean landscape. Oceanic expeditions. Theo addressed issues regarding the recycling and decommissioned of oil platforms for use as an adaptable “base-camp” for oceanic exploration. Currently, the periods of exploration and size of exploration craft is limited. Future operations suggest for more extended periods of exploration and craft that could house a larger research crew, endure adverse weather conditions, be self-sustaining and cater for the new adventure-tourist. In third place is Handre de la Rey with his entry ‘Kinetica Art Lab’;The art of technology inspiring innovation. His project proposes to reinstate the grain conveyor system situated within the Clock Tower Precinct of the Victoria & Alfred Waterfronts. The Collier Jetty previously served as a functional grain conveyor system. His thesis recommends using Kinetic Art as a system of movement to evoke a contemporary sense of life while simultaneously embracing its historical function. The chosen site for the proposed project is in Cape Town, South Africa, within the Clock Tower Precinct of the Victoria & Alfred Waterfronts. The Collier Jetty, located within the above-mentioned precinct, serves as the primary selected context where the jetty historically served as a functional grain conveyor system. The project aims to develop and reinstate the grain conveyor system by recommending to convert the said historical structure into a kinetic art gallery. The existing structure flourished as a system of movement which will now be re-imagined by means of Kinetic Art and will evoke a contemporary sense of life while simultaneously, embracing its historical function. Best use of Clay Brick was awarded to Aleksander Troskolanski. His thesis is entitled, “Symposium for Participatory Democracy: Translating a Site of Protest” His sports ground is sited at Currie’s Fountain and is the site of a rallying point for social, political and cultural symposiums. Troskolanski said, "clay face brick has been used for it's textural quality. It is a material that responds to the textural fabric of the place and contributes in developing a site specific response that communicates with the materiality of Curries Fountain as well as the spirit of the precinct." The institutional winners go on to compete in the finals of the 27th National Student Architect Awards at in Johannesburg in April 2014, when the overall winner will be presented with a cheque for R50 000. 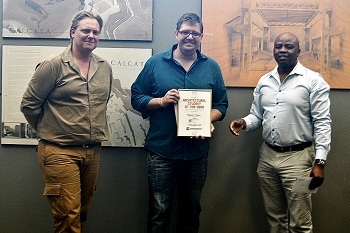 Caption: Pictured at the Corobrik Architectural Student of the Year regional award ceremony at the University of Free State are from left, Henry Pretorius (UFS), Wynand Viljoen (Regional Winner) and Thomas Dlengezele (Corobrik). 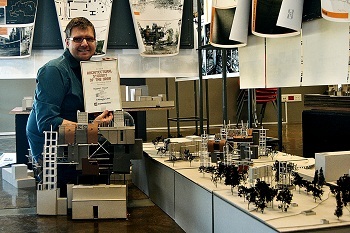 Wynand Viljoen of the University of the Free State has won the regional finals of the Corobrik Architectural Student of the Year for his thesis entitled. “Raptured” which is a burial complex for the evacuees of Pripyat. He is pictured with his thesis, proudly displaying his certificate. Additional photographs, and photographs of his thesis are available, please contact Shirley Williams for these extra images.